The storms over the past few weeks have filled South Bay reservoirs and in some cases overfilled them. Crews with the Santa Clara Valley Water District has been releasing water from the Anderson Reservoir at the rate of about 180,000 gallons a minute. Officials have had to place caution tape around the area to keep captivated visitors at a distance. Meanwhile, many parts of the South Bay Hills are saturated from the constant rain, creating waterfalls in the landscape and lots of standing water on roads. 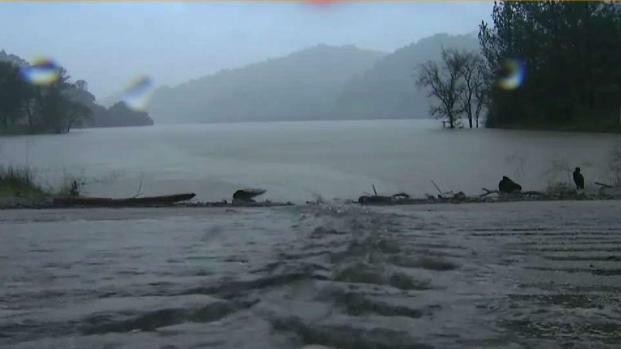 The biggest ongoing concern is Uvas Reservoir in Morgan Hill, which once again was filled above capacity on Wednesday and spilled over. But as the water district points out, there was no immediate flood threat. The storms over the past few weeks have filled South Bay reservoirs and in some cases overfilled them. Robert Handa reports. Still, for those who have to evacuate local camping areas suddenly during previous storms, the constant spilling in unsettling. "If it's like 102-104 percent and going over the spillway, and then if we get maybe a day or two of hard rain -- coupled with the mountain runoff -- you can at times 'overwhelm' the reservoir," said Walter Lynch, Travel Trailer owner. Wednesday's rain reminded some people who were evacuated during earlier storms that they might have to do it again soon. While Uvas Creek has at time spilled over its banks, there were no reports of flooding. And stops at nearby Chesbro Reservoir and the Anderson Dam showed a lot of water, but no immediate threat.